Plats – scale divisions of land or property – are an important form of urban cartography. 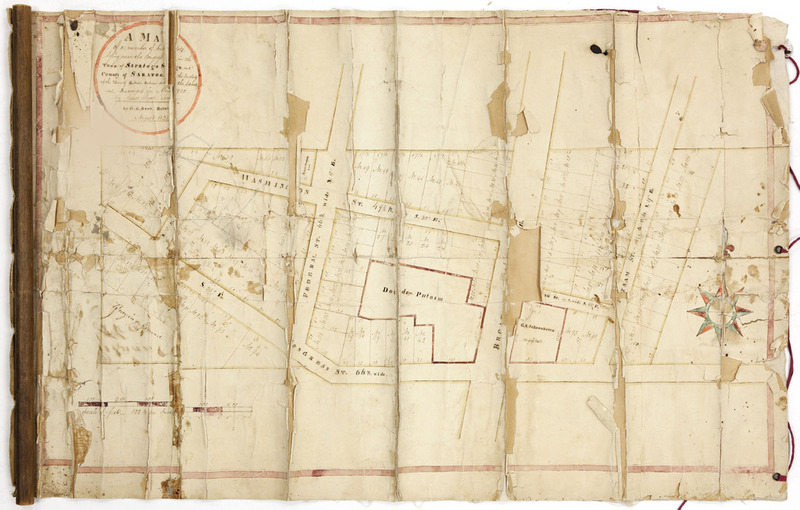 Three versions of this 1810 plat, one of the earliest of Saratoga Springs, show founder Gideon Putnam’s properties around Congress Spring shortly before his death, mapping out Saratoga Springs’ transition from rural land to urban settlement. Putnam and his wife Doanda settled in the area 1789. As he cleared his several hundred acres, Putnam found a number of springs along the fault line, realized their potential, and established Putnam’s Tavern and Boarding House in 1802, beginning Saratoga Springs’ rise as a tourist destination and thriving resort center. The original Scott map is both foundational and influential. It inspired at least two later manuscript versions. 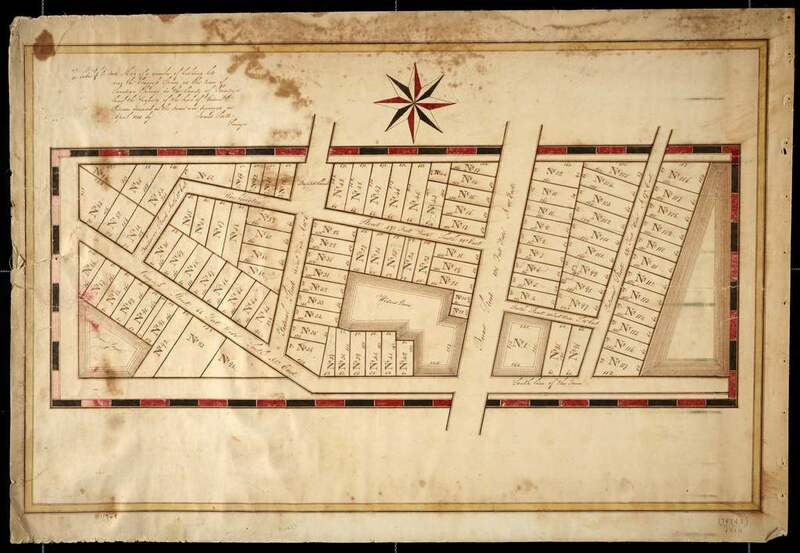 In addition, not only is it cited in the 1826 charter incorporating Saratoga Springs, but this plat map (as other similar plans) is used in property transfers into the twentieth century, as in notices from 1874 and 1941 (both announced in The Saratogian). This beautifully colored, undated version of James Scott’s 1810 survey of Putnam’s properties reveals the layout for an urban space still visible in the city today. Putnam created Broad Street, now Broadway, which still anchors Saratoga Springs’ vibrant downtown. Visitors still travel the other roads represented in the map. 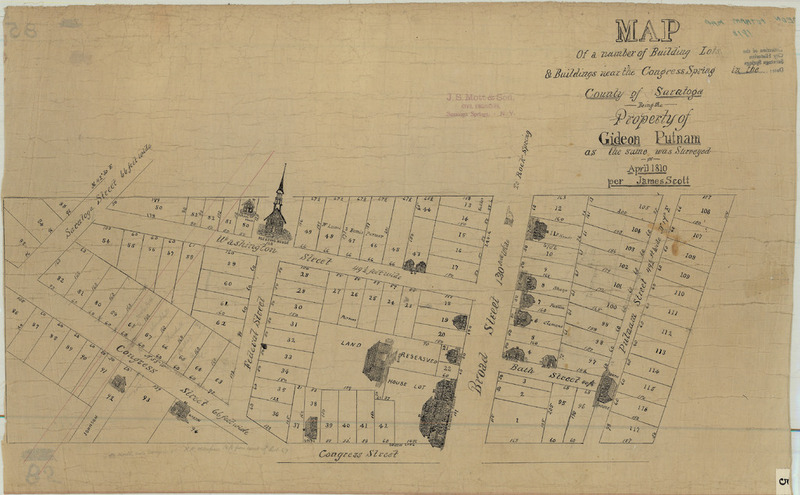 Beyond creating a basis for the transportation network and streetscape of Saratoga Springs, Putnam’s map conveys his interest in civic life through donation of land for a church, cemetery, and school in the new settlement. The extension of Broad, Federal, and Putnam Streets beyond the map's borders suggests Putnam anticipated future growth. This 1825 copy, drawn by G.G. Scott, son of the original surveyor, held by Saratoga County. 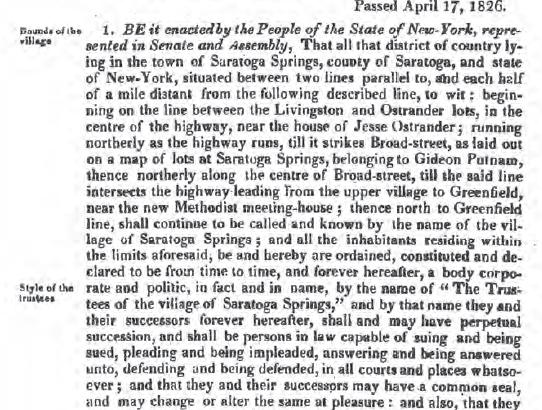 Since the map is cited in the 1826 charter incorporating Saratoga Springs (see excerpt below) perhaps G.G. Scott made it to help establish the corporation line (see excerpt below). Alternately, since the map indicates that it is made for Putnam's heirs, it may also have been drawn to support a property case. Many maps in the County Historian's office have been stored on rollers in the past. 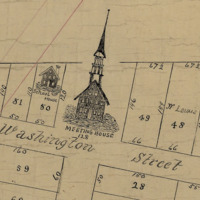 The City Historian's office holds several versions of this tracing, with additional buildings, of the Putnam plat. This copy is stamped J.S. Mott & Son, suggesting that it was created around the turn of the 20th century by the Motts. Perhaps the village engineers wished to be able to consult the original plats by which the town's properties were divided. In pre-automobile days, having a tracing on hand, in their offices, would have saved the 8-mile and time consuming trip to consult originals in Ballston Spa, the county seat. Whatever motivated them, this lively copy offers insight into early architecture, from school and church to bathhouse.